Designed to help attain a flawless look. Four sharp gripping points make minimal contact so glaze fills in any marks. 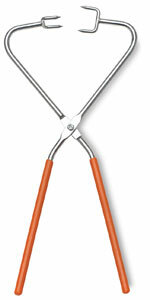 Plated steel tongs. The dipped plastic handles help grip various-sized pieces.